Every lampshade connects to the lamp via a fitter. There are several types of fitter styles and you need to understand the differences before you start shade shopping. For table lamps, a washer fitter is the most common. It is shaped like a washer and attaches to the lamp harp. A finial is screwed on the harp to hold the shade in place. Other common fitters include UNO fitters for floor lamps and bulb-clip fitters for smaller shade applications. Some new big box store lamps do not use a harp. The frame of the original shade extends to a larger ring that connects to the socket and is secured with a ring. These lamps use plastic sockets (phenolic sockets) and are sometimes reffered to as NORD sockets. Using a NORD socket harp base, you can make the lamp work with a traditional harp and washer fitter lampshade. 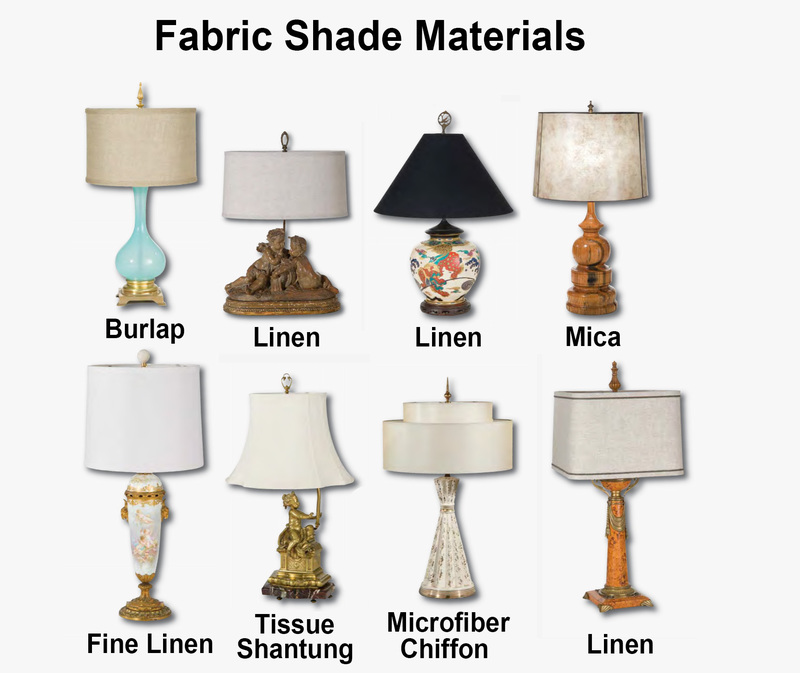 Fabric lampshades are made in a variety of materials including, burlap, linen, silk, cotton, and polyester. Some unique shades may be covered with faux leather, mica, and parchment. The decor and setting can help guide your decision. A cottage or cabin would be a great place for burlap. More formal settings might require silk or linen shades. Victorian lamps probably need some fringe and silk to keep with the style of the lamp. The material should complement the lamp and the room. Fabric shades come in many different shapes. When choosing the shape, the lamp shade should be similar to the shape of the lamp base. Also, consider the location of the lamp as certain shapes allow the lamp to set closer to the wall or other furniture. A lamp base with an Asian motif looks good when paired with a Pagoda style shade.Mid-century lamps often look best with a drum shaped lampshade. As with the material, the shape of the shade should complement the shape of the lamp. Click here to view our extensive selection of fabric lamp shades. Fabric lampshades are commonly measured by height, bottom diameter, and top diameter. The bottom and top diameter are usually relational, so for measuring purposes, you should focus on the bottom diameter and height of the shade. Measure your lamp from the base to the bottom of the harp. The best way to determine the bottom diameter of the shade for your table lamp is to measure the lamp height from the bottom edge of the table lamp base to the top of the lamp stem, (just below the socket cap) (see Fig. 1). The shade you choose for your lamp should have a bottom diameter that is within 2”, plus or minus, the measured height of your lamp. 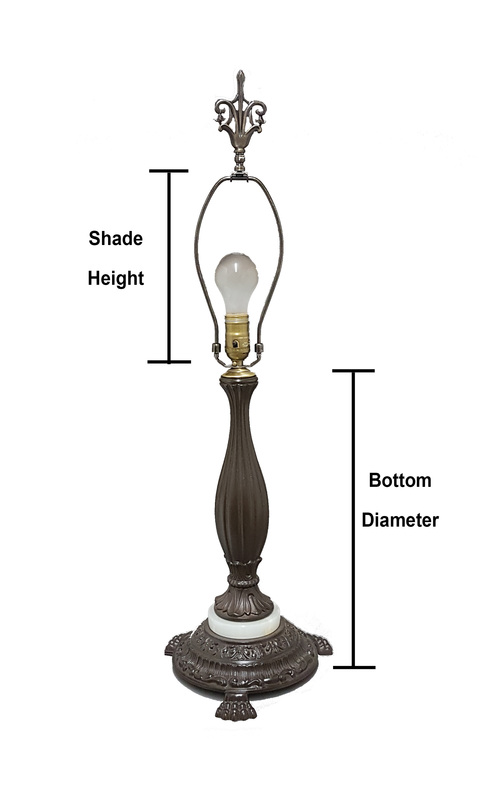 For example, if your lamp height (measured by the method noted above) is 14” tall, the shade you select (depending on your preference for a small, medium, or larger looking shade) should have a bottom diameter of 12”, 13”, 14”, 15” or 16”. 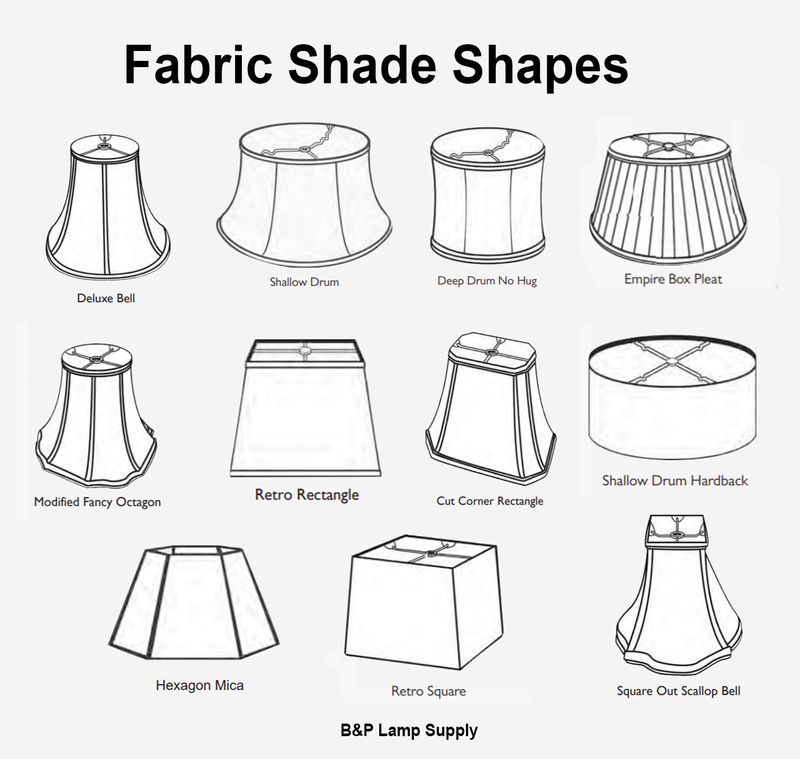 Our fabric shade descriptions will describe the Bottom diameter of each shade. (see Fig. 2). Please see the information provided in frequently asked questions about choosing the correct lamp harp size. For example, if your harp is 7” tall, the shade you select should have an overall height in the range of 7 1/ 2” to 6 1/ 2”. Our fabric shade descriptions will provide the overall height of each shade. The shade height is important because you want adequate coverage of the bulb without covering the lamp base. Note: Fringe and tassel should not be included in the measurement of the overall height of the shade. Once you have selected the shade's shape, bottom diameter and overall height, which would be appropriate for your lamp, you can match the shade's shape and dimensions to our extensive selection of fabric lamp shades. Now it is time to see all your hard work and research pay off. You have selected the fitter, material, shape; measured and picked the right size shade. Using the fitters, attach the shade to the lamp. Make sure the shade fits properly to the lamp and is secure with a final for washer fitter shades. Make sure the bulb is secure for bulb clip shades. 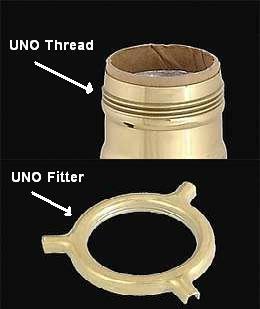 UNO fitter shades should thread securely on the socket. Pets, especially cats, love to test the strength of any lamp component. Do not give them an opportunity to spoil your hard effort. Congratulations!The job is done. You now have the knowledge to fit a lamp with a new shade. Some table lamps have multiple sockets or "clusters." 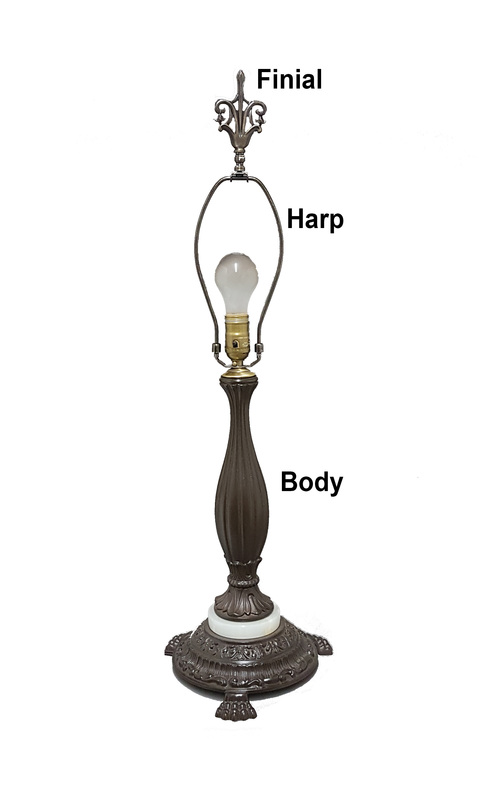 While a lamp with clusters will not have a harp, determining the proper height of a shade is similar to a lamp with a harp. The height of the shade should not exceed the the height of the cluster stem plus 1/ 2”, and should not be smaller than the height of the cluster stem minus 1/ 2”. To select the bottom diameter of the shade for your lamp, see step 2 above. **Safety Tip** Never allow a bulb to be within one inch of the shade material. Certain shapes, like the bell, could be too close to the bulbs in a cluster. The bottom diameter of the floor lamp shade is related to the diameter of the lamp base. To determine the size, measure the bottom diameter of the floor lamp base. A 10” floor lamp base should have an 18” bottom diameter shade. 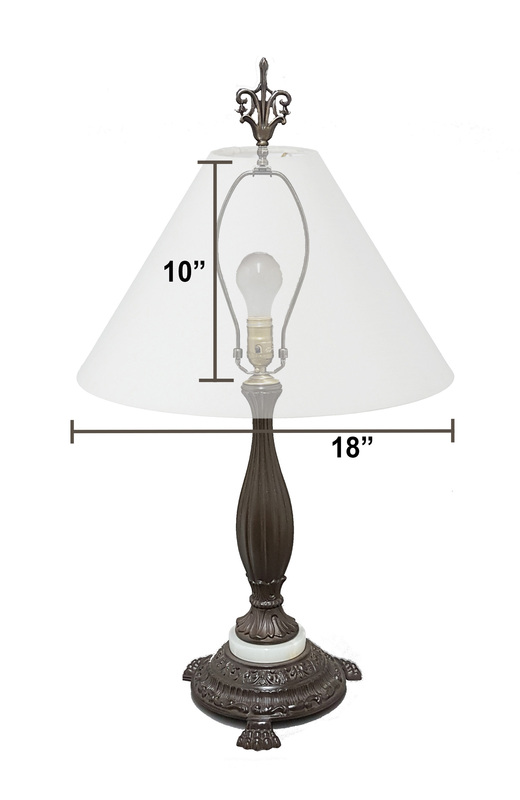 An 11” to 12” floor lamp base needs a 19” Jr to 20” Jr bottom diameter shade. 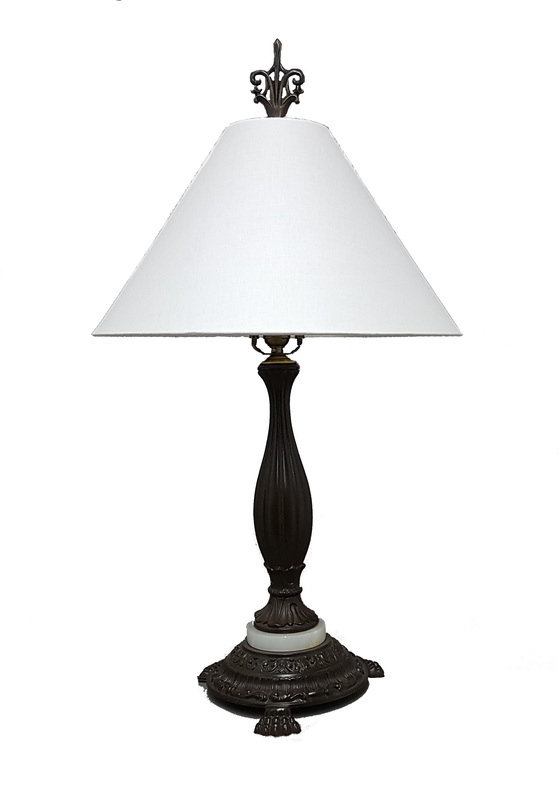 A 13” or bigger floor lamp base will look good with a 20” to 22” bottom diameter shade. Finally, the overall height of the floor lamp shade you select should be within the range of 10” to 13”. The main guideline is - floor lamps with UNO sockets require shades with UNO fitters. Most of our shades with UNO fitters are similar in size ranging from 10” to 13” bottom diameter. For the best fit, match the shape of the shade with the shape of the base or select a shade style you like best for your lamp. For chandelier and wall sconces having candle covered sockets, we suggest using our miniature fabric shades with torpedo style fitters. You will also need to use torpedo style bulbs to fit the torpedo style fitters. Select a shade size based on the bottom diameter of the shade. The simplest way to determine the correct bottom diameter of the miniature shade is to measure the length of the candle cover. Candle covers usually come in standard lengths such as 2”, 3”, 4”, 5”, and 6”. The length of the candle cover should be approximatly the bottom diameter of the shade you select. In other words, if you have a 4” length candle cover on your chandelier or wall sconce, you should select a 4” bottom diameter shade. I have a glass shade on my table lamp. Can I change from a glass shade to a fabric shade? Should I use a Regular Weight or Heavy duty weight harp on my lamp? What does UNO fitter and UNO Holder mean? What does washer fitter mean? What is an IES shade? What is a Chimney Fitter? What are Bulb Clip Fitters and Torpedo Clip Fitters? What does a Bridge Floor Lamp, Reflector Type Floor Lamp, and a Floor Lamp with a Washer Type Fitter Look Like? - I have a glass shade on my table lamp. Can I change from a glass shade to a fabric shade? 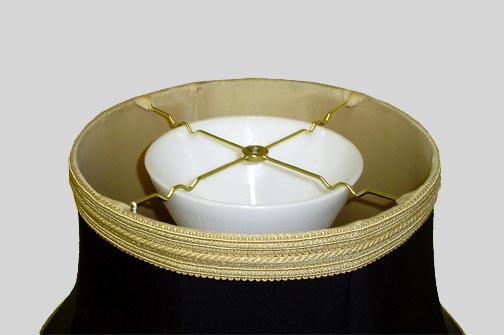 If you have a lamp with a #1 or a #2 or a #3 size brass collar, you can convert your lamp from fitting a glass shade to fitting a fabric shade using our adapters. First, remove your lamp’s burner by gently screwing the burner counterclockwise until it comes off the collar. Next, measure the inside diameter of the collar. If it measures 7/8” inside diameter, you should have a #1 size collar. If it measures 1 3/ 16” inside diameter, you should have a #2 size collar. If it measures 1 ¾” inside diameter you should have a #3 size collar. All lamps with other size collar diameters cannot be converted to holding fabric shades by using adapters. If you have a #1 size collar (7/8” inside diameter) see adapters #30343, 30344, and 30345. If you have a #2 size collar (1 3/16” inside diameter) or a #3 size collar (1 ¾” inside diameter) see adapters #30346, 30347, and 30348. Our electrified adapters come with a 9” length harp mounted for a fabric shade. 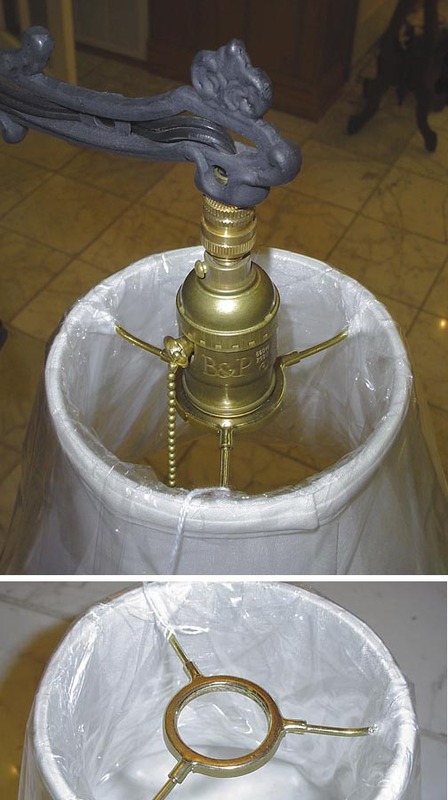 They will screw into your lamp’s collar and allow you to mount a washer fitter fabric shade onto the top of the harp. (Please see information provided in “Frequently asked questions” for selecting a harp size (length) for your shade if you need a size other than 9” long.) For a #3 collar you will need to also order a #20001 - #3 to #2 reducer to screw into your lamp’s #3 collar and the adapter’s #2 male collar. - Should I use a Regular Weight or Heavy Duty weight harp on my lamp? Most table lamps, which accept fabric shades are set up with industry standard Regular Weight harps and Regular Weight harp bases. We recommend that you order Regular Weight harps for your lamps. If your lamp already has a harp base (metal piece mounted below the socket that looks like rabbit ears) and you want to change the length of your harp, then you can use a Regular Weight harp. A Regular Weight harp will fit either a Regular Weight harp base or a Heavy Duty harp base. When mounted on a Heavy Duty base, a Regular Weight harp may seem a little loose. You can use wire pliers to carefully crimp the U-shape ears of the harp base so that the harp fits more snuggly. What size (length) harp do you recommend for my fabric shade? Rounded down to 7.50 or 7 ½” harp is correct for this shade. - What does UNO fitter and UNO Holder mean? Occasionally fabric shades will have “UNO fitter” hardware that is designed to screw onto a standard lamp socket. Our fabric shade descriptions will specify UNO fitter if they have the UNO fitter hardware. The UNO fitter is located in the center of the metal tripod spider, which is located in the top of the shade. The shade’s UNO fitter has threads and is designed to screw onto a lamp’s socket (provided the socket has threads on the metal outer shell). See UNO fitter below, shown on a bridge arm lamp. - What does washer fitter mean? Many fabric and paper shades have a washer fitter. 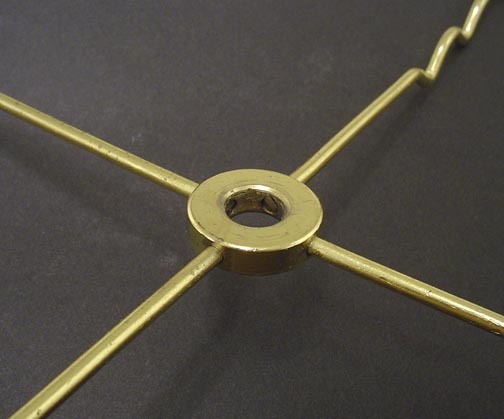 The washer fitter is located in the center of the metal tripod spider, which is located in the top of the shade. The washer fitter is shaped like a washer and has a 7/16” diameter center hole, which allows the washer to slip over either a ¼” diameter rod or 3/8” diameter rod. (Most lamp harps have a 1/4” diameter (1/4-27 M) and some lamp cluster bodies have a 3/8” diameter (1/8; IPS rod) located on top of the harp or cluster). Usually, a finial is screwed on top of the rod to lock the washer fitter of the shade down firmly. See washer fitter below. Click here to view our extensive selection of lamp finials. - What is an I.E.S. shade? An I.E.S. shade is made of white colored glass, is shaped like a cone, and comes in 3 sizes: 6”, 8”, and 10”. The sizes are measured at the top outside diameter. I.E.S. shades are used on some floor lamps. The illustration below shows an I.E.S. shade fitted to the IES bends of a washer-type fitter fabric. Also, see the illustration of a Reflector- Type Floor Lamp at the bottom of this page. To determine the correct fabric shade to fit your I.E.S. shade, you must first measure the top outside diameter of your I.E.S. (opal glass) shade. The fabric shade actually rides on top of the I.E.S. shade. As mentioned, the top diameter will be either: 6”, 8”, or 10”. Then when selecting a fabric shade, look for footnotes in our fabric shade descriptions which state, “ Also fits 6” 8” or 10” shades”. The properly mounted fabric shade, with I.E.S. fitter, will set centered when placed on top of your I.E.S. shade. To determine what size I.E.S. glass shade your floor lamp needs, measure the inside diameter of your floor lamp’s lamp socket cover known as an I.E.S. glass holder. It should measure either 2 ¼” inside diameter or 3” inside diameter. (These measurements are approximate). If it measures 2 ¼” inside diameter, your lamp can take either a 6” or an 8” diameter I.E.S. shade (our part number’s 08390 (6”) and 08391 (8”). 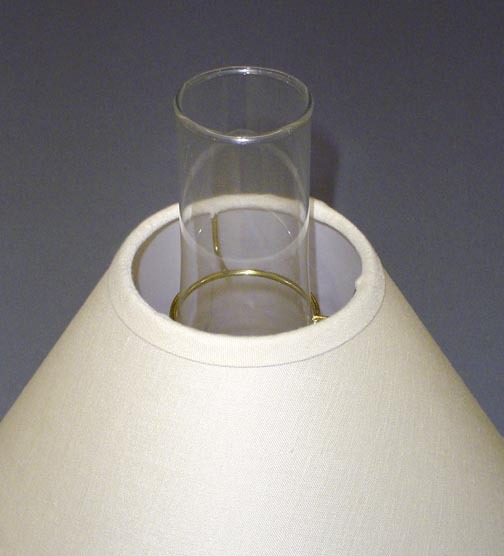 If your holder measures 3” inside diameter, your lamp needs a 10” I.E.S. holder (our part number 08392). - What is a Chimney Fitter? Fabric shades that have a chimney fitter are designed so that the shade is actually mounted to the lamp via a glass chimney. These chimneys are like those used on early kerosene lamps (see photo below). The inside diameter of the chimney fitter is usually around 2.25 inches. - What are Bulb Clip Fitters and Torpedo Bulb Clip Fitters? Bulb clip fitters are usually found on small and miniature type shades that are sized for chandeliers, sconces, and boudoir table lamps. Bulb clip fitters attach to regular-style incandescent light bulbs. 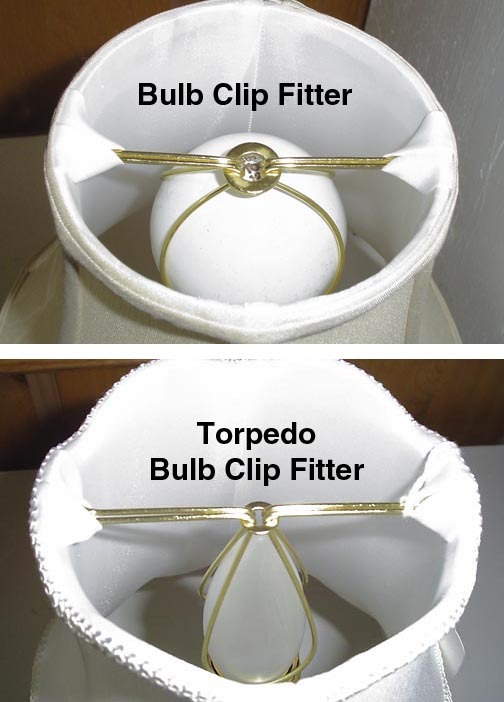 The Torpedo bulb clip fitters are more narrow in shape and are designed for torpedo shaped light bulbs. The photo below shows the two different styles of bulb clip fitters. - What does a Bridge Floor Lamp, Reflector Type Floor Lamp, and a Floor Lamp with a Washer Type Fitter Look Like?